Description: Inspired by annual trips to London to witness the brass band finals at Royal Albert Hall, the Fountain Creek Brass Band was motivated to record a collection of some of the most cutting edge and challenging brass band literature available. 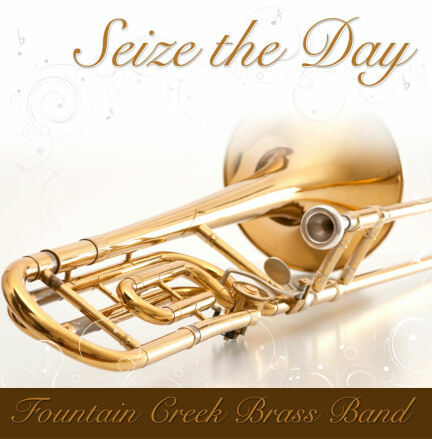 The title track, 'Seize the Day', was premiered at a concert attended by members of the Fountain Creek Brass Band in London in 2009 and accurately represents what the band intended to accomplish with this release. The CD also includes advanced British concert pieces and marches, American concert pieces for brass band, and features noteworthy solos from Keven Stewart (trombone) and Frank Hilligas (tenor horn). This release documents the Fountain Creek Brass Band's expansion into new extremes of the brass band tradition and will leave the listener excited for more. CD Price: $17.99 + FREE Shipping in the U.S.
CD Price: $14.99 + FREE Shipping in the U.S. Description: Colorado's premiere British Brass Band, the Fountain Creek Brass Band is comprised of many of Colorado's leading soloists, performers, chamber musicians, and orchestral players. Founded in 1999 and based out of Colorado Springs, CO, the group performs regularly throughout the Colorado Front Range area. The Fountain Creek Brass Band has been the focus of television news broadcasts and newspaper articles in Denver and Colorado Springs. 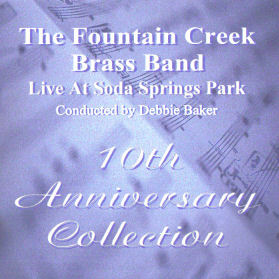 In celebration of their 10th Anniversary, the Fountain Creek Brass Band has released a collection of their best live performances at the Soda Springs Park amphitheater. The CD contains a diverse musical assortment, including traditional British marches, Hollywood compilations, swinging traditionals, and stirring American patriotic medleys that truly represent the spectacular talents within the band's membership. The 10th Anniversary Collection, Live At Soda Springs Park, leaves the listener with a complete understanding of and appreciation for the British Brass Band tradition. 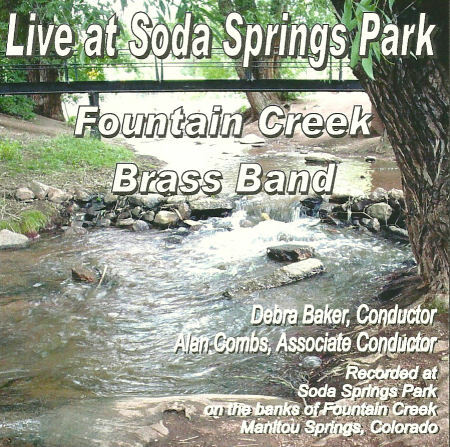 Description: Recorded at Soda Springs Park on the banks of Fountain Creek, Manitou Springs, Colorado. 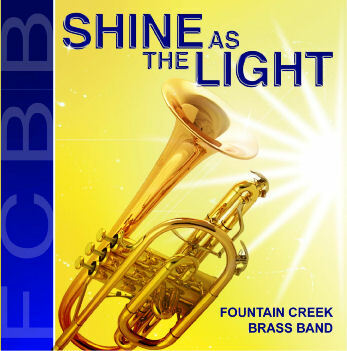 The band's first live recording, the CD captures the essence of the Fountain Creek Brass Band's summer series concerts. Includes solos by Dr. Ritchie Clendenin (cornet) and Frank Hilligas (cornet). CD Price: $12.99 + FREE Shipping in the U.S. 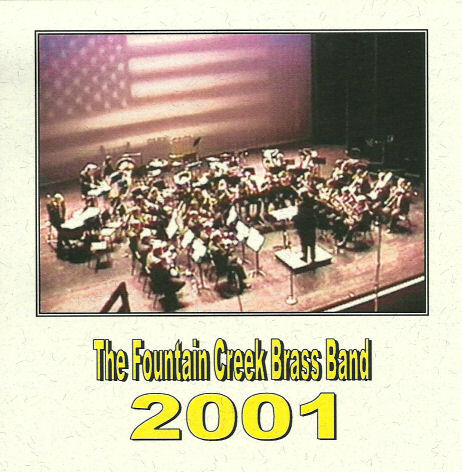 Description: The first CD recorded by the Fountain Creek Brass Band. It features audience favorites from its Summer Concert Series at Soda Springs Park in Manitou Springs, Colorado, including fanfares, marches, hymns, classical, and partiotic music. Solos are performed by Dr. Ritchie Clendenin (cornet) and Frank Hilligas (cornet). It is now simpler than ever to support the Pikes Peak Brass Band. As a 501-C(3) non-profit organization, your charitable contribution will help maintain an organization that is whole-heartedly focused on educational outreach and support of the continued growth of music in Denver, Colorado Springs, and Pueblo communities. If you recently attended a concert and were unable to make a donation or if you just want to help the band continue to keep music alive in our schools and communities, please consider making a donation. The amount is up to you.Because we are non-profit, you contribution is tax-deductible. All online donations are processed using Paypal, which enables you to donate easily and securely with a credit card, debit card, or your checking account. If you prefer not to use Paypal, please contact us directly so that we can arrange to accept your donation. The Pikes Peak Brass Band thanks you sincerely for your consideration & support!